I saw a flyer on a grocery store bulletin board recently. It looked like an advertisement for a used couch or guitar lessons. It had tabs at the bottom of the page to tear off and take with you. 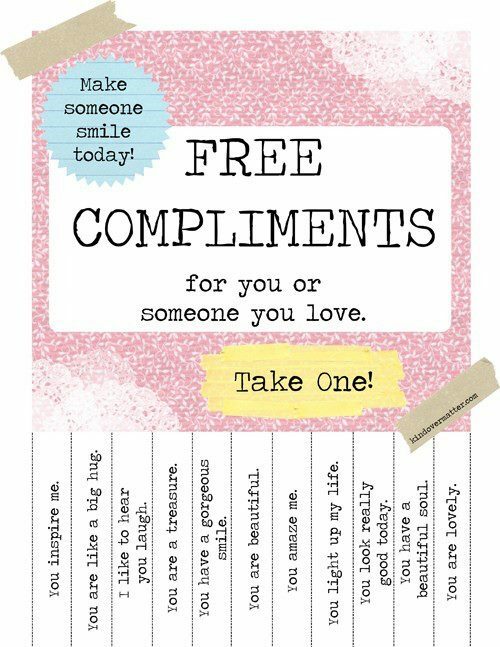 Print a compliments flyer and leave it in a public space — or create your own. You never know you might make a difference in someone’s day. Thank you!! I’m going to steal it from you and make my own for my students. They come from multi-generational poverty and I’ve been looking for ways to make affirmations an everyday piece of their lives. You are precious and I so appreciate your sharing of this gift! Sincerely. Reblogged this on The Social Wizard.